A gorgeous and feminine option, fashion forward rose gold engagement rings are here to stay. Pair this spectacular metal with a classic colorless diamond, or choose a fancy colored center stone for a truly one-of-a-kind pairing. 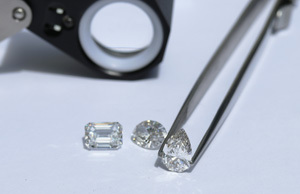 Each piece of Ada Diamonds jewelry is fully bespoke and made to order. Browse our collection of brilliant settings to get inspired and then design your prefect ring with an Ada Diamonds Concierge. Add a contemporary pave band for a look as unique as your love. Mix and match your favorite eternity or half eternity band styles. While white and yellow gold remain the most popular choices for engagement ring settings, rose gold's popularity is rising and it's clear this trend is here to stay! Rose gold is actually a gold and copper alloy, with the copper providing the warm pinkish hue to the metal. Because copper is included in the alloy, it results in a metal that's more durable than white or yellow gold. The vintage feel of rose gold also appeals to many people and it's an excellent choice to complement any skin tone. For all the wonderful attributes of rose gold, they are not hypoallergenic due to the copper content and thus, not a good choice for those with copper allergies. Your Ada Diamond Concierge will guide you through the process of selecting the ideal ring and look for you. Inquire today to get started. From audacious bespoke pieces to stunning daily wear, Ada's conflict-free fine jewelry is made with superlative lab grown diamonds to perfectly compliment your rose gold engagement ring.